Whether your company is big or small, The Michigan Pedaler does #WorkOutingsThatWork. 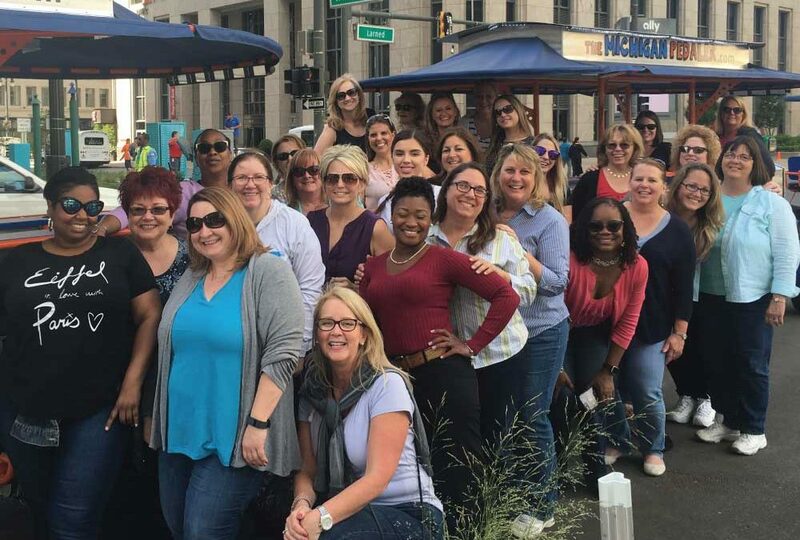 Company rides and corporate rides on The Michigan Pedaler are so much fun for the employees… and so easy to plan for the office assistant or boss. Basically, sign up – and we’ll take it from there. 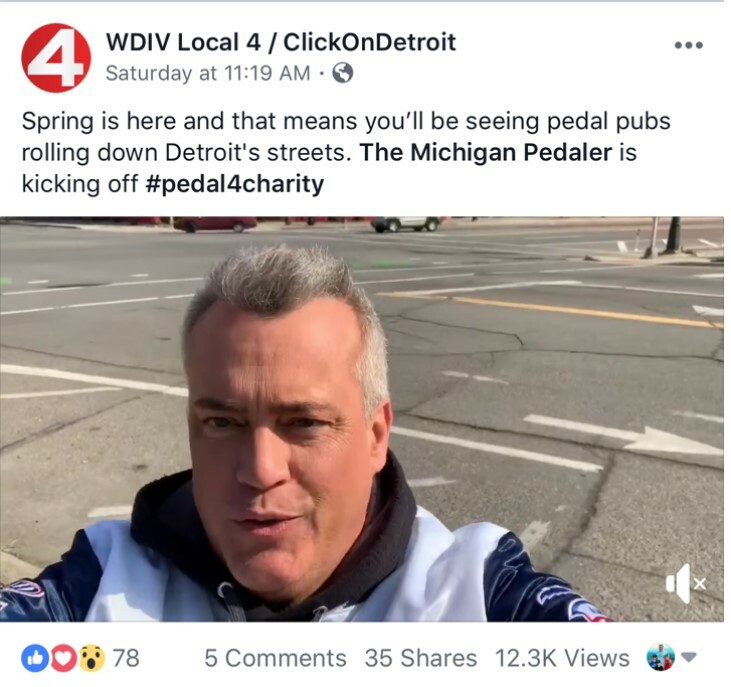 It is why Detroit and Southeast Michigan’s leading companies choose to work with The Michigan Pedaler for their company outings. We’ve worked with Fortune 500 Companies… and we’ve worked with small offices of less than 15 people… and hundreds of companies in between. The Michigan Pedaler does #WorkOutingsThatWork. We make it so your team or staff get off our bikes in a mood much better than they started. 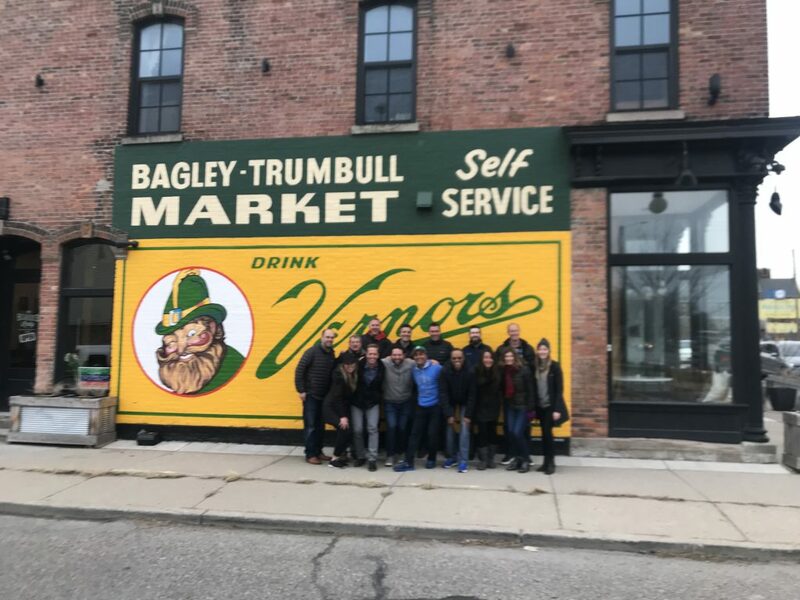 So before we put this in PowerPoint, let’s walk through just how we can turn your office team building effort or fun outing into one that will be memorable, improve morale, and is FUN FUN FUN. Our office staff is available to email, text or talk on the phone to help you get the details of your ride just right and work you through any questions that you may have. Feel free to call us at 313.744.3272 or email us at info (at) michiganpedaler.com. With five bikes, the Michigan Pedaler can accommodate groups of up to 75 people. 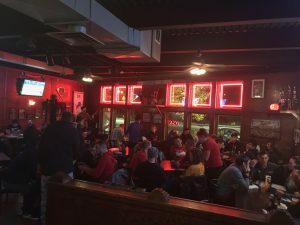 McShane’s main floor, spacious enough to accommodate any group size. We have up to five bikes for you to use meaning we can take up to 75 people at a time. Larger group than 75?… give us a call. We can talk ways we can accommodate even bigger groups. Pre or Post Dinner or Lunch Options. Do you want to do a lunch or dinner before your ride? Our rides start and end at McShane’s Irish Pub and Whiskey Bar on the corner of Michigan and Trumbull. We can give you information on planning an event with them that includes the main floor or their outside patio, plus an extensive catering menu. McShane’s is willing to customize catering menus as well, so you and your group can eat as much or as little as you’d like. Whatever works best for you. What do you want to do on your ride? We don’t cookie-cutter you into a set event. We realize that different work cultures and environments require customization, including what can be brought on the bike, what happens over the course of the two-hour tour, and more. We’ll make sure that we can handle those special requests. 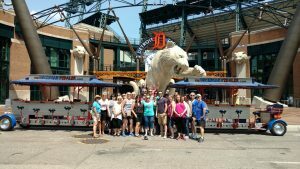 One of our favorite stops on a Michigan Pedaler ride is to bring a group to Comerica Park for a picture in front of the big tiger. Our bike routes take you throughout the city – whether it is Downtown, Corktown, Midtown, or Eastern Market. You have the ability to provide your employees, clients, or out-of-town guests a unique look at The D.
Want to take a break in pedaling? 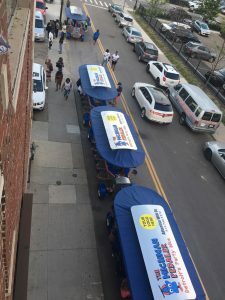 We have a group of partner bars that we work with to bring your employees in to get a break from the heat and enjoy a frosty cold one or a frozen margarita. Want your employees to lay off the sauce? We can do that too. We have a number of recommendations if you want to have less of a focus on alcohol. There are numerous ideas of stops we could make that do not center around alcohol. Whether that is a quick stop for ice cream, a stop for a historic building tour, a stop at one of the city’s magestic parks or a stop at one of Detroit’s shops (Shinola anyone? ), we can help you plan a route that your employees will enjoy. Some groups prefer a stop on their route for food. We understand this idea and will help cooridate with you timing so that you can have food ready and prepared for you when you arrive to maximize your time on the bike. This is an example of why we receive five stars for customer service. Our bike can accommodate all – whether your staff is full of fitness gurus or people that are not, young and old, big and small. Don’t worry that the ride will be “too hard” for people on your team. Our electric assist makes pedaling a breeze and our back bench allows some to sit back and enjoy the ride. Pipe in your own tunes into our sound system to set whatever tone you want for the day. 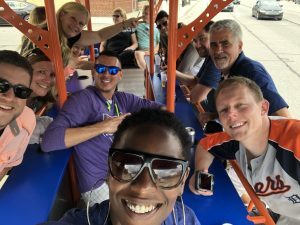 Whether you are pedaling The D to Motown or Big Sean, Sinatra or Gaye, Eminem or Dre, Food Fighters or Ed Sheeran… your group will be experiencing a fun time. Our Michigan Pedaler drivers make it a fun and enjoyable experience for all. 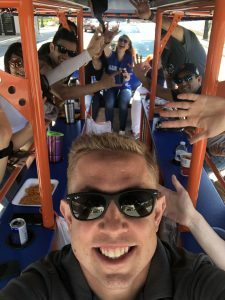 A ride on The Michigan Pedaler is more than just a ride — our drivers interact with you to make it even more fun. Are you ready for some fun? Give us a call and book your corporate ride today. The Michigan Pedaler provides your staff or team #WorkOutingsThatWork.